Residents take photos and try to touch one of the three Balangiga church bells after a ceremony returning them to the church in the town of Balangiga in the Philippines on Dec. 15, 2018. 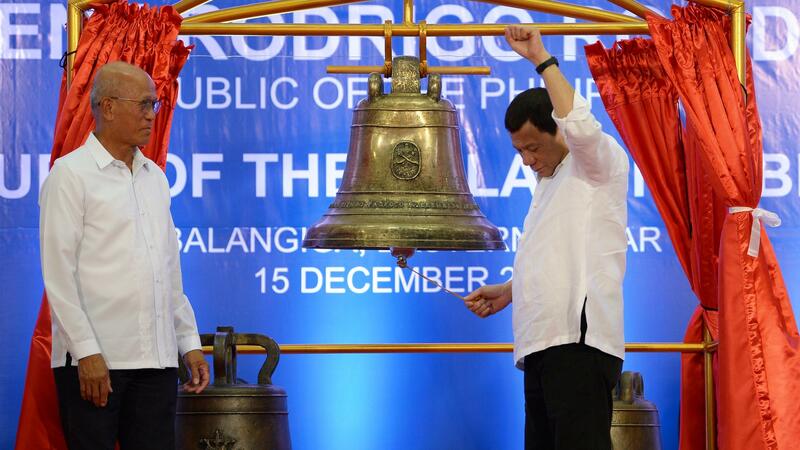 Philippines President Rodrigo Duterte, widely praised among Filipinos for raising the profile of the Balangiga bells with the Americans, tolls one of the three returned. Saturday¹s ceremony marked the first time the bells have been rung in the city in 117 years, when their pealing signaled an attack on occupying U.S. forces. The Philippines and the United States have reached a rare meeting of the minds: Both are enthralled that church bells seized by the U.S. have been returned to the Philippines after 117 years. President Rodrigo Duterte, unaccustomed to lauding the U.S., took pains Saturday to call the repatriation of the iconic artifacts "a generous act" by the Americans. For their part, U.S. officials stopped short of an apology, but have acknowledged that returning the bells, "was quite simply the right thing to do," in the words of John Law, the deputy chief of mission for the U.S. embassy in the Philippines. 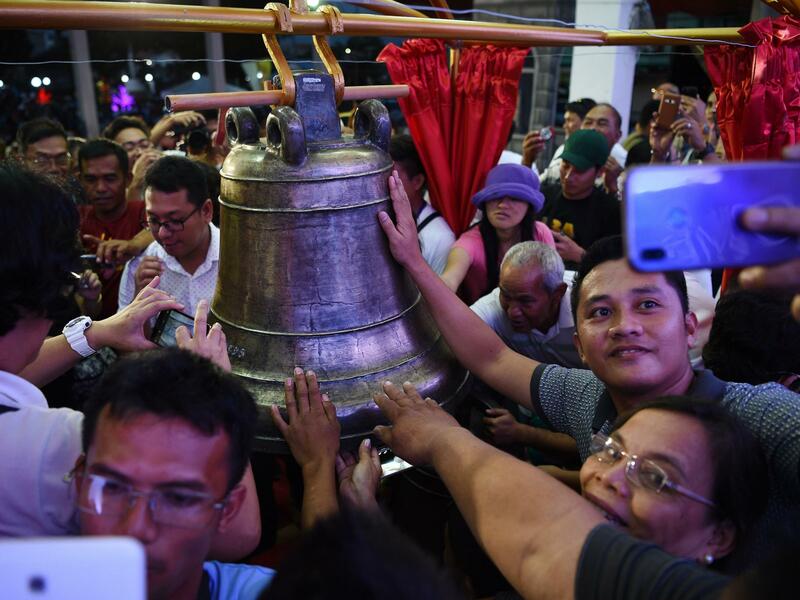 The small central Philippines town of Balangiga swelled with dignitaries, citizens, and emotions at the homecoming of their historic bells Saturday. The last time the bells tolled in Balangiga, the U.S. was the colonial power in the Philippines, succeeding Spain. The local fighters chafed under American occupation, and had used the bells to signal an attack on their U.S. occupiers. The uprising may have been the bloodiest defeat of Americans in the Philippine-American war. Retaliation orders rang out. "Kill and burn," American soldiers were told, and from the charred Catholic Church of Saint Lawrence the Martyr, the bells were seized as spoils of war. At Saturday's ceremony, Duterte pulled a rope that rang the smallest of the three bells arrayed in an outdoor auditorium that overflowed with military officials, U.S. veterans, citizens and clergy. Long at loggerheads with the Catholic Church in the Philippines, Duterte was all diplomacy at the ceremony, outstretching a hand to bishops, archbishops and the papal nuncio, who were all on hand for the ceremony. Duterte has stoutly demanded that the Americans return the bells, reminding his countrymen of the role the U.S. played as colonizer. But there was no trace of hostility Saturday — no caustic remarks, only gratitude and graciousness. "The bells are returned," Duterte said. "The credit goes to the American people and the Filipino people. Period." Archbishop of the U.S. military services, Timothy Broglio, said the bells are a sign of solidarity between the two countries. "It's also restoration of this property to the Church so that these bells can continue to exercise the function for which they were first made, which is to call people to worship." Law, from the U.S. embassy, said that all other bells from U.S. conflicts had been returned, except for Balangiga's — an anomaly he acknowledged was wrong. Returning them, Law said, "restored to a friend and ally an important symbol of national independence, an important symbol of the country's faith." He said their return closes a "painful chapter." The repatriation of the bells removes a point of contention between the two countries that could ease the way for better cooperation at a time when there is much riding on warmer relations. Under Duterte, Manila has moved closer to China and away from its historic treaty ally, the U.S.
Dennis Wright, a former navy captain who has worked to get the bell returned, said that the holding of them for over a century violated the norms that govern war booty dating back to the Civil War. Under those norms, private property taken during wartime must have a purpose in prosecuting the war. When the war is over, the booty is supposed to be returned. The episode involving the celebrated bells has persisted 117 years, spanning the life of the U.S.-Philippine relationship. The people of Balangiga came out in droves to witness the return of the bells and see history come full circle. Among them was Terencia Dunninghaus, 63, a descendant of those who had battled the Americans a century ago. "I'd like to cry, I'm so happy," she said, tears choking her voice. "How many years of waiting? It's already one century, but at long last the bells [have] come home." For Dunninghaus, the bells symbolize all the ancestors who died in the struggle to win independence for the Philippines. As if on cue, the ceremony ended and the sky was suddenly awash with flights of birds, diving and circling the town square. The birds nest in the town's mahogany trees, one elderly gentleman said; "those are the spirits of the dead." Now to the Philippines, where President Rodrigo Duterte, often a harsh critic of the United States, praised Americans today as generous for returning church bells stripped by U.S. forces in 1901. The town of Balangiga celebrated the homecoming of their historic bells. NPR's Julie McCarthy was there, and she has this report. JULIE MCCARTHY, BYLINE: Balangiga's iconic church bells were carted off as war booty and returned here resonating. MCCARTHY: The last time these bills tolled in Balangiga, the U.S. was the colonial power here. Local fighters had used the bells to signal an attack on the U.S. occupiers. The uprising turned out to be the bloodiest defeat of Americans in the U.S.-Philippines war. Retaliation orders rang out - kill and burn, american soldiers were told. And from the charred Catholic Church of St. Lawrence the Martyr, the bells were seized as spoils of war. PHILIPPINES RODRIGO DUTERTE: I share your happiness and joy today. MCCARTHY: Philippine President Rodrigo Duterte pulled the rope that tolled the smallest of the three bells arrayed in an outdoor auditorium. Earlier, Duterte had staunchly demanded that the Americans return the bells, reminding his countrymen of the role the U.S. played as colonizer. But there was no trace of hostility today, only gratitude and graciousness. DUTERTE: The bells are returned. The credit goes to the American people and to the Filipino people. MCCARTHY: Timothy Broglio, archbishop of U.S. armed forces, says the bells are a sign of solidarity between the two countries. TIMOTHY BROGLIO: It's also restoration of this property to the church so that these bells can continue to exercise the function for which they were first made, which is to call people to worship. JOHN LAW: Was quite simply the right thing to do. MCCARTHY: Law noted that the episode of the bells, 117 years long, had spanned the life of the U.S.-Philippine relationship. The people of Balangiga came out in droves to witness history coming full circle. Terencia Dunninghaus, a descendant of those who had battled the Americans a century ago, stood in front of the church that had lost and now won back its bells, tears welling in her throat. TERENCIA DUNNINGHAUS: I'm so happy. MCCARTHY: Crying tears of joy? DUNNINGHAUS: Yeah, for how many years that - of waiting. It's already one century, but at long last, the bells come home, yeah. (Foreign language spoken). MCCARTHY: For Terencia, the bells symbolize all the ancestors who died in the struggle to make the Philippines free. As if on cue, the ceremony ended, and the sky was awash with birds, flights of them diving and circling the townsquare. They nest in its mahogany trees, one elderly gentleman said, adding, those are the spirits of the dead. Julie McCarthy, NPR News, Balangiga. Transcript provided by NPR, Copyright NPR.